Four invitations to WGLNA Season 2 are up for grabs tonight! All games are broadcast live at wglna.com and on twitch. Please note that the last match is scheduled for 7pm, Cap Fast Nation vs. Turtle Police! Edited by Captain_Judo, Sep 05 2013 - 00:46. I think you double posted? Good luck to all! May the games be great and the competition fierce. Edited by Garmin_leFabre, Sep 04 2013 - 23:20. He got rid of the evidence damn fast too! Ooh, cool. Do I have to shave my neckbeard to be seen in public? Wait a sec...if a Dev makes a mistake and double posts...where does the 2nd thread go? The Nether-verse? When are we going to get non-live stuff? I mean I'd love to watch the Season 1 finals... but nope. I mean the highlights page in the wglna site hasn't been updated in over a month now. Really? There should be a giant post absolutely begging me to watch the finals at the top of that page. If you want this to take off as an esport it kinda helps to allow people to I dunno... actually watch it. You can find all of the matches on Twitch, they are there. I completely agree that the WGLNA website needs to be updated more frequently, however I believe(I could be wrong) that responsibility lies with hero level productions aka wgl staff, and not directly wargaming. Dangit, where is Junior when I need to pester him. 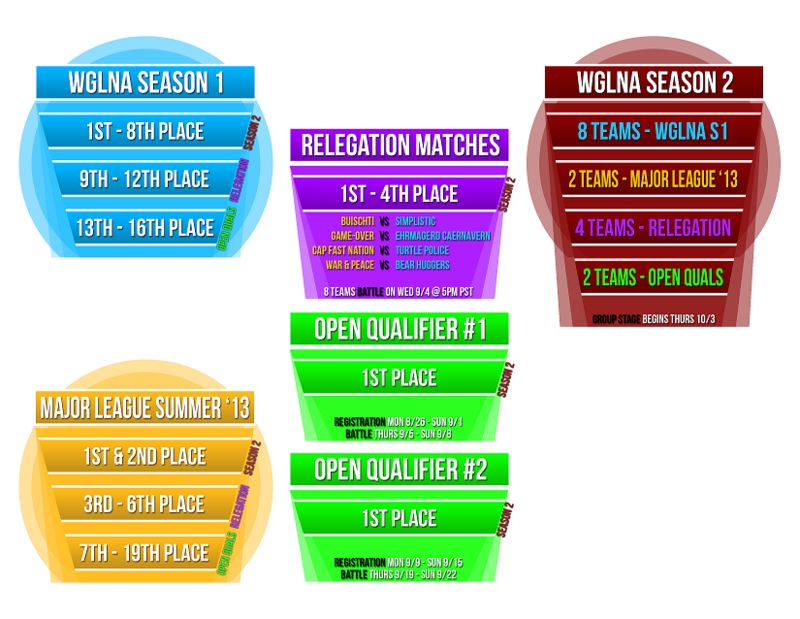 Edited by Zakume, Sep 04 2013 - 23:42.
any idea for the schedule of WGLNA qualifiers? well. Good luck to the teams playing today! On the stream it says Season 1 Relegation Matches. Might wanna get someone to change that to Season 2. Also, Is it just me or did Ben seem exhausted? I always like it when he casts though, him and Kevin catch onto things very quick and theorize very well. #BlameJunior the icons were off on the minimap in the first match. Need le team logos on victory screen too :3. Also update the map preview fidelity, looks like they were on minimum settings when they did those. Edited by Zakume, Sep 05 2013 - 05:45.